When you change to connect the F series, FZ5 series, or FZ5-L series to FH series Sensor Controller, you can convert by using the appropriate parallel converter cable of FH-VPX series under the usable condition. Do not use RESET signal. Use with COMIN and COMUT are same power source. Use with COMIN and COMOUT are same power source. Do not use DI5 and DI6. Do not use DI8 and DI9. Note:	Please be careful while cable processing, for EtherCAT, connectors on both ends should be shield connected and for EtherNet/IP, connectors on only one end should be shield connected. Ver.1.__ The Sysmac Studio is the software that provides an integrated environment for setting, programming, debugging and maintenance of machine automation controllers including the NJ/NX Series, EtherCat Slave, and the HMI. Note	1. Site licenses are available for users who will run Sysmac Studio on multiple computers. Ask your OMRON sales representative for details. 2. Sysmac Studio version 1.07 or higher supports the FH Series. Sysmac Studio does not support the FH-L550/-L550-10. Please purchase a CD-ROM and licenses the first time you purchase the Application Producer. CD-ROMs and licenses are available individually. The license does not include the CD-ROM. Application Producer Software components that provide a development environment to further customize the standard controller features of the FH Series. (±5%) 0.5? 1.0? 1.5? 2.0? 4.0? Note	1. Fixing the lens or other reinforcement may be required depending on the installation angle or operating environment (vibration/shock). When fixing the lens, insulate the lens from the fixture. 2. The above specifications are values calculated from the optical design and can vary depending on installation conditions. Maximum outer diameter: 12 mm dia. 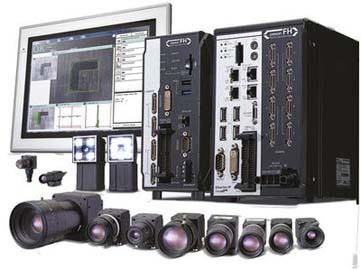 Supported camera FH-S series camera All of the FH-S series cameras are connectable. 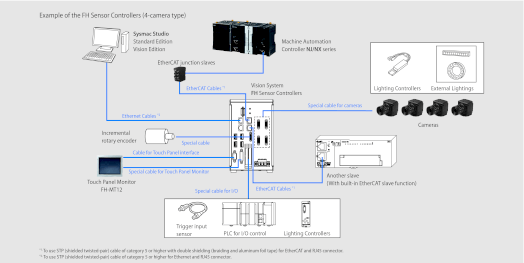 All of the FH-S series cameras are connectable. All of the FH-S series cameras are connectable. All of the FH-S series cameras are connectable. FZ-S series camera All of the FZ-S series cameras are connectable. Setup Create the processing flow using Flow editing. Operation mode: Except Multi-line random-trigger mode. Operation mode: Multi-line random-trigger mode. Use 3 to 4 Lines. Use 5 to 8 Lines. a Controller Connected to 2 cameras 5.0 A max. 5.4 A max. 6.4 A max. 4.7 A max. 5.0 A max. 5.9 A max. Connected to 4 cameras - 7.0 A max. 8.1 A max. - 6.5 A max. 7.5 A max. Connected to 8 cameras - - 11.5 A max. - - 10.9 A max. to a controller Connected to 2 cameras 4.1 A max. 4.2 A max. 5.2 A max. 3.6 A max. 3.7 A max. 4.5 A max. Connected to 4 cameras - 4.8 A max. 5.6 A max. - 4.3 A max. 5.0 A max. Connected to 8 cameras - - 6.8 A max. - - 6.2 A max. Current consumption When connected to a Controller Connected to 2 cameras 3.5 A max. 3.7 A max. Connected to 4 cameras - 5.9 A max. When not connected to a Controller Connected to 2 cameras 1.5 A max. 1.7 A max. Connected to 4 cameras - 2.0 A max. Vibration tolerance 5 to 8.4 Hz with 3.5 mm amplitude, 8.4 to 150 Hz, acceleration of 9.8 m/s? Shutter speeds can be set from 60 μs to 100 ms. Note:	FH Series Sensor Controllers version 5.32 or higher is required. Current consumption Approx. 0.7 A max. Note:	When you connect a LCD Monitor FZ-M08 to FH sensor controller, please use it in combination with a DVI-I -RGB Conversion Connector FH-VMRGB. Topology Depends on the specifications of the EtherCAT master. Send/receive PDO data sizes Input 56 to 280 bytes/line (including input data, status, and unused areas) Up to 8 lines can be set. Output 28 bytes/line (including output data and unused areas) Up to 8 lines can be set. Use the latest version of Sysmac Studio Standard Edition/Vision Edition. FH-1050 (-_) Version 5.60 Supported by version 1.15 or higher. Version 5.50 Supported by version 1.14.89 or higher. Version 5.30 Supported by version 1.10.80 or higher. Version 5.20 Supported by version 1.10 or higher. Version 5.10 Supported by version 1.07.43 or higher. Version 5.00 Supported by version 1.07 or higher. Not supported by version 1.06 or lower. POWER LED Lit while power is ON. ERROR LED Lit when an error has occurred. RUN LED Lit while the layout turned on output setting is displayed. ACCESS LED Blinks while the internal nonvolatile memory is accessed. SD POWER LED Blinks while power is supplied to the SD memory card and the card is usable. SD BUSY LED Blinks while the SD memory card is accessed. EtherCAT RUN LED Lit while EtherCAT communications are usable. EtherCAT LINK/ACT IN LED Lit when connected with an EtherCAT device, and blinks while performing communications. EtherCAT LINK/ACT OUT LED Lit when connected with an EtherCAT device, and blinks while performing communications. EtherCAT ERR LED Lit when EtherCAT communications have become abnormal. EtherNet NET RUN1 LED Lit while EtherNet communications are usable. EtherNet NET LINK/ACK1 LED Lit when connected with an EtherNet device, and blinks while performing communications. EtherNet NET RUN2 LED Lit when EtherNet communications are usable. EtherNet NET LINK/ACK2 LED Lit when connected with an EtherNet device, and blinks while performing communications. A SD memory card installation connector Install the SD memory card. Do not plug or unplug the SD memory card during measurement operation. C USB connector Connect a USB device. Do not plug or unplug it during measurement operation. D RS-232C connector Connect an external device such as a programmable controller. E DVI-I connector Connect a monitor. F I/O connector (control lines, data lines) Connect the controller to external devices such as a sync sensor and PLC. G EtherCAT address setup volume Used to set a node address (00 to 99) as an EtherCAT communication device. H EtherCAT communication connector (IN) Connect the opposed EtherCAT device. I EtherCAT communication connector (OUT) Connect the opposed EtherCAT device. J Encoder connector Connect an encoder. K Camera connector Connect cameras. L Power supply terminal connector Connect a DC power supply. Wire the controller independently on other devices. Wire the ground line. Be sure to ground the controller alone. PWR LED Lit while power is ON. SD PWR LED Lit while power is supplied to the SD memory card and the card is usable. SD BUSY LED Lit when access to the SD memory card. Ethernet NET RUN LED Lit while Ethernet communications are usable. Ethernet NET LINK/ACT LED Blinks when connected with an Ethernet device, and blinks while performing communications. A SD memory card installation connector Install the SD memory card. Do not plug or unplug the SD memory card during measurement operation. Otherwise measurement time may be affected or data may be destroyed. B USB 2.0 connector Connects to USB 2.0. Do not insert or remove during loading or writing of measurement or data. The measurement time can be longer or data can be damaged. C USB 3.0 connector Connects to USB 3.0. Do not insert or remove during loading or writing of measurement or data. USB 3.0 has a high ability to supply the bus power. Use the Sensor Controller by combining USB 3.0, faster transport can be realized. D Ethernet connector Connect an Ethernet device. Shared Ethernet port and EtherNet/IP port. E RS-232C connector Connect an external device such as a programmable controller. F Monitor connector Connect a monitor. (control lines, data lines) Connect the controller to external devices such as a sync sensor. H Camera connector Connect a camera. I Power supply terminal connector Connect a DC power supply. Wire the controller independently on other devices. Wire the ground line. Be sure to ground the FH Sensor Controller alone. Панель оператора системы тех. зрения FH, 12"